With the recent announcement of our Intervals web-based mobile app for time tracking and task management we introduced a scaled down interface to our online project management software. 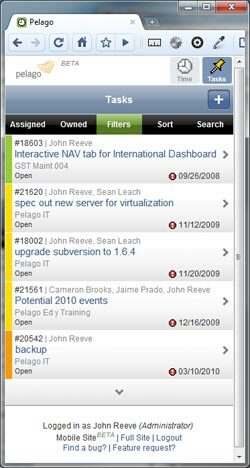 Given the limited screen real estate available on most mobile phones, the more comprehensive Intervals online software has been reduced to only the essential features needed while on-the-go. Those of you with web-enabled smart phones will find it easy and convenient to start timers in the middle of meetings and assign tasks while waiting at the bus stop. But, what if you simply want to experience the scaled down version of Intervals without requiring a mobile phone? It’s a widget-like experience, ideal for netbooks and smaller laptops with lower screen resolution. Tracking time and managing tasks are the core strengths of Intervals. Use the mini version for these tasks and fire up the full version for more comprehensive project management. We’ll be adding basic project management features next. The scaled-down version of the Intervals trifecta — time tracking, task management and project management — will all be available via the new mini mode. Leave the heavy lifting to the full app. Log in to your Intervals account, throw a ‘m/’ on the end of your URL, and take Intervals Mini for a spin. If you don’t have an Intervals account, go get one. Let us know what you think. We’re still looking for ideas on how to make the Mobile and Mini experience better, and how to best incorporate the upcoming project management features. Would like to see a top level access to “Add time” on the mobile app similar to Timers. I never remember to start the timers but often want to update the timesheet when on the road (before I forget what I did when I get to the office the next day!). Thanks for the input. We do have this feature on our list of updates. Glad to hear you will find it useful. I have tried to see how the app works with a Blackberry Curve 8900 using different combinations of website addresses eg with(out) https and with(out) m. None of them work. I have a good signal and Java is enabled. Am I doing anything wrong?